Questions about Aix En Provence? Our community of experts can help you find what you’re looking for. Home to the most exquisite architecture in the world, Aix En Provence, France bursts with culture. With its grand monuments lurking in almost every corner, it is clear why this city is well-known for its arts and lights. The beautiful gardens of the Pavillon de Vendome invite visitors and locals alike to have a moment of peace and relaxation while admiring the historical and ancient décor of the building that houses 18th century findings and a textile library. Along with the Pavillon de Vendome, there are many other historical monuments whose architecture manifests the importance of artistic expression in French civilization. Aix En Provence is also known to have influenced some of the most famous artists in the world, such as François Marius Granet and Paul Cezanne, whose works remain a cultural phenomenon even to this very day. 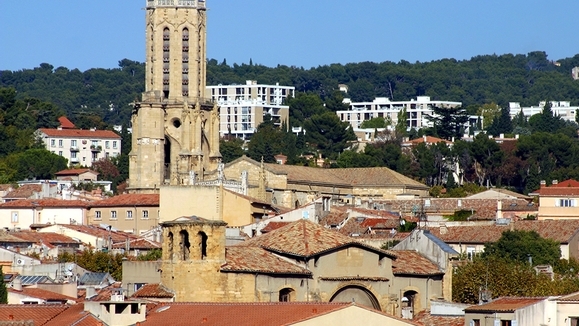 A striking city located in France, Aix En Provence is an inspiring memory of ancient traditions. Its population is approximately 137,000 and it is surrounded by picturesque mountains, fountains, mysterious statues, and deep blue seas and villages that are located within distance to the city. Most of the art exhibits whether it is books, music, paintings, sculptures, statues, or architecture has been inspired by the beauty of Aix En Provence, and tourists are able to explore this beauty by venturing on the educational and popular tours. Le Montagne Sainte Victoire is a vast, astounding mountain, overlooking the city, and it is commonly seen in many of Paul Cezanne’s paintings. Victor Varsarely, known as the father of Op-Art, had a strong impact in pop culture in the 20th century. His exquisite method of combining architecture and art proved that art improved life daily. The Varsarely Foundation, which houses 42 of his massive works, is a fascinating attraction and representation of Varsarely’s views with its unique design and its décor of 16 hexagonal units. Along with Varsarely Foundation, the museums and attractions and exhibitions mainly celebrate the talents of various French artists and the structures of the buildings. In addition to sightseeing, nourish your memories with souvenirs of hand-made jewelry or clothing from one of the charming boutiques or stomp on grapes at a vineyard and have a glass of red or white wine. You can take a leisurely walk around Cours Mirabeau to see stylish homes or Place de l'Hotel de Ville and visit the vibrant markets as you admire the panoramic view of the mystical buildings. By night the historical town becomes a vibrant city. Nightclubs, pubs and bars entice visitors with their scrumptious menu, quenchable drinks, lively discos and upbeat music. Savor the French culture by indulging in Aix En Provence’s amazing cuisine. There are a variety of foods that will satisfy your gastronomical needs. Products such as thyme, oregano, tomato, olives, and calisson (made from almonds and preserved fruit) are common foods used in traditional French delicacies. Many restaurants, cafés and bistros offer a tranquil atmosphere, scenic view, and pleasing, multicultural menu. The climate of Aix En Provence is quite enjoyable. The summer temperature averages around 22 °C (71.6 °F). However, during the months of June-August temperatures can soar as high as 30°C (86°F). Throughout the day it mainly hot with a slight breeze which makes the climate enjoyable. During the winter the city rarely experiences freezing temperatures. However, temperatures can be as low as 2°C-18°C (35.6°F-64.4°F). Marseille Marignane Airport services international airlines such as British Airways and Air France to Aix En Provence. Upon arrival tourists can either rent a car or take a shuttle bus to their desired location. Trains and buses are convenient for traveling throughout the city and to other major European cities. Also, bicycling is also a relaxing way to enjoy the weather and bask in the scenery of the city. Have travel questions? Our community of experts can help. Pose your inquiry to professional travel agents from all over the globe. Tribes are groups of people with shared interests in travel. Similar to forums, tribes are a place to hold conversations centered on a destination, type of travel, activity or event. They can be public or private and can focus on the places you know and love most. By creating tribes, you can gather your friends, family, colleagues or customers in one place to lead discussions, ask and answer questions, post photos and videos of past trips, and meet new people who share your travel interests. To create a tribe, click the “Create” button within the Tribes section of your profile. Here you can name your tribe, fill out a description and choose your privacy preferences. You will also choose what category your tribe falls under and tag it with related destinations and keywords that will help your tribe show up in the appropriate sections of the site.